Here is a video slideshow I made of this article. Watch if you do not want to scroll down to read this long article. 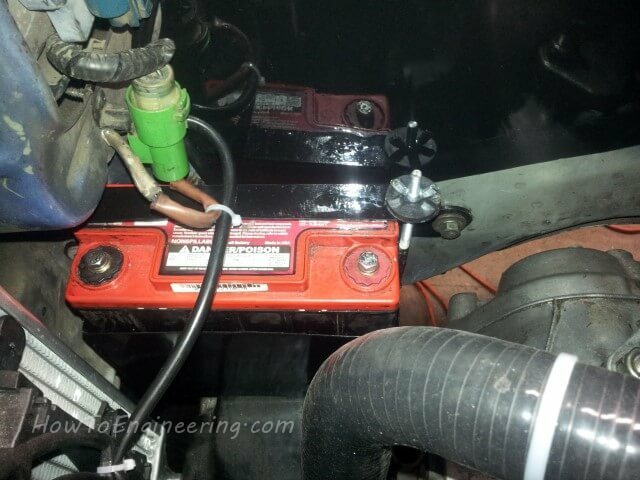 I placed the battery in this spot, and it seems perfect, and there are stock bolt locations I can use. 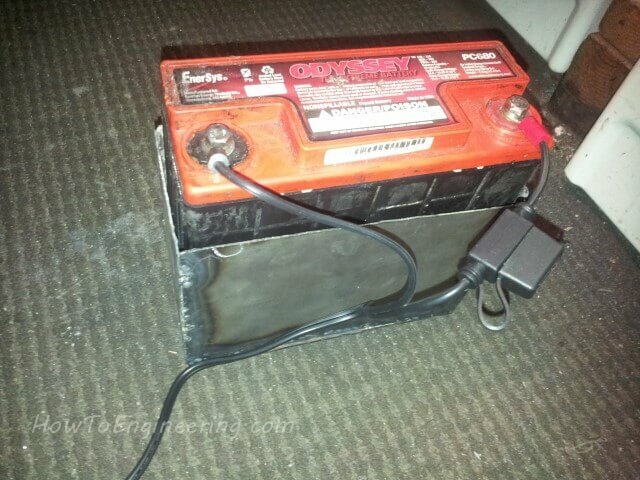 Seems to be plenty of room around the battery. 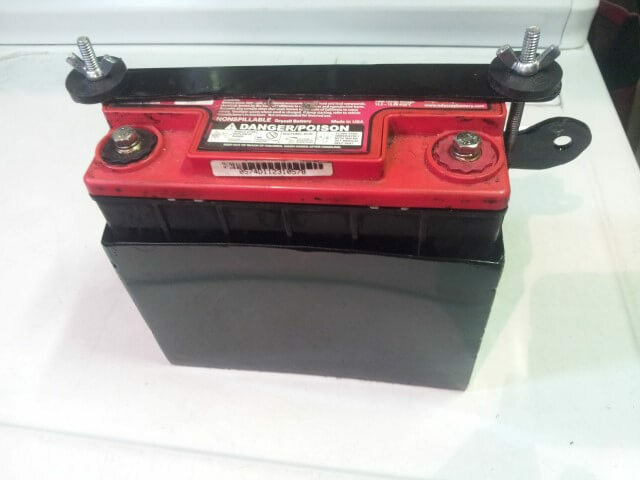 The stock battery tray. 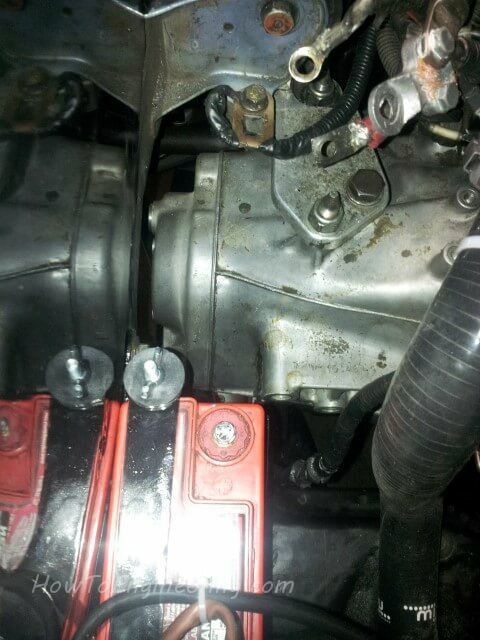 Its bolted on with 4 bolts. 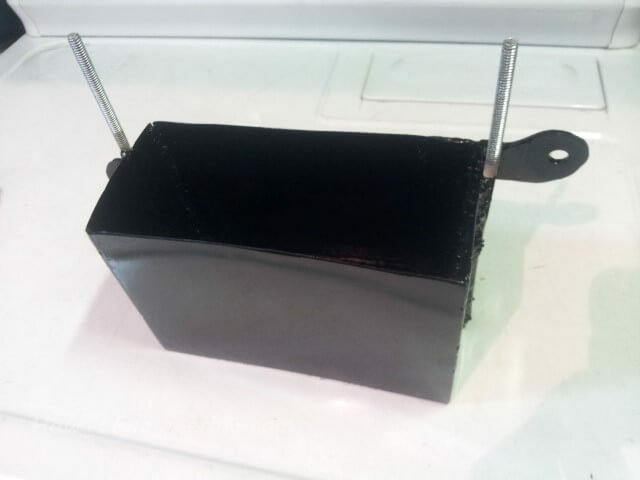 Here is a side view of the stock battery tray. 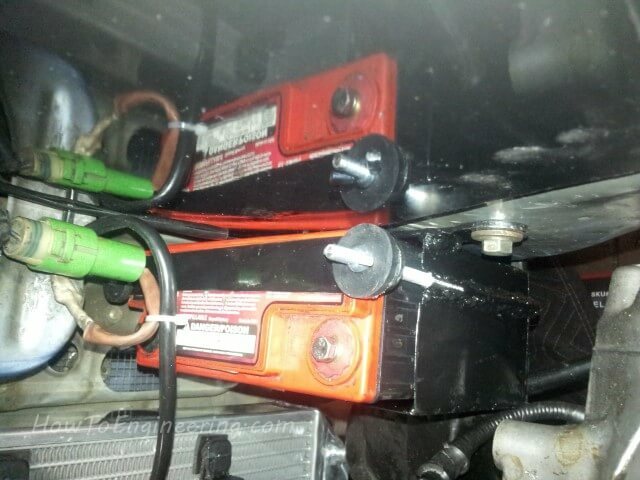 And here is all the different battery tie downs I have tried. 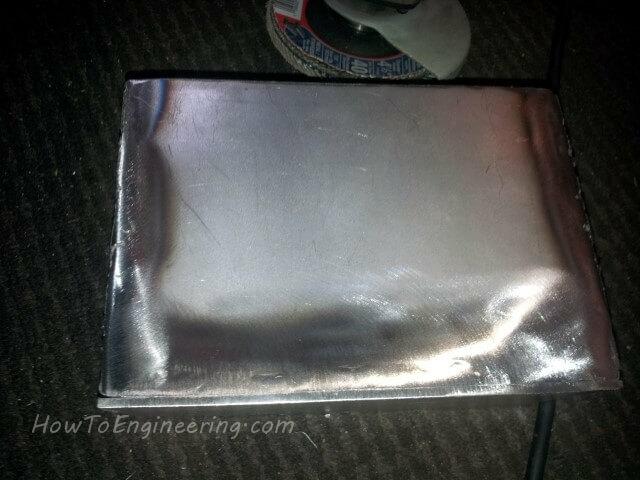 I got out all my sheet metal and took a look at what I can use for a battery box. 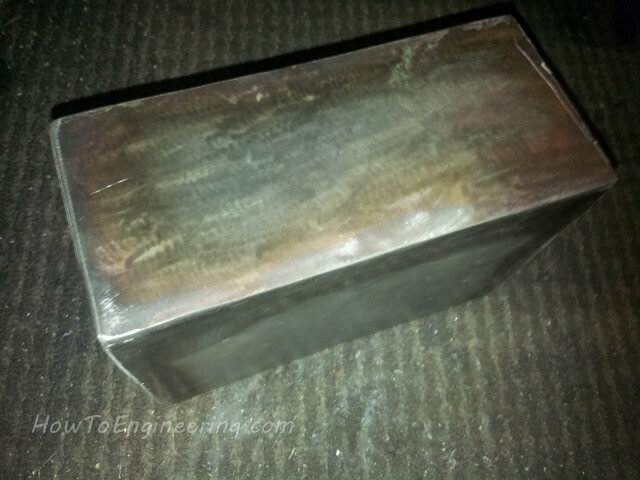 There is some 22 gauge (The gauge sometimes reads a side smaller then the metal). 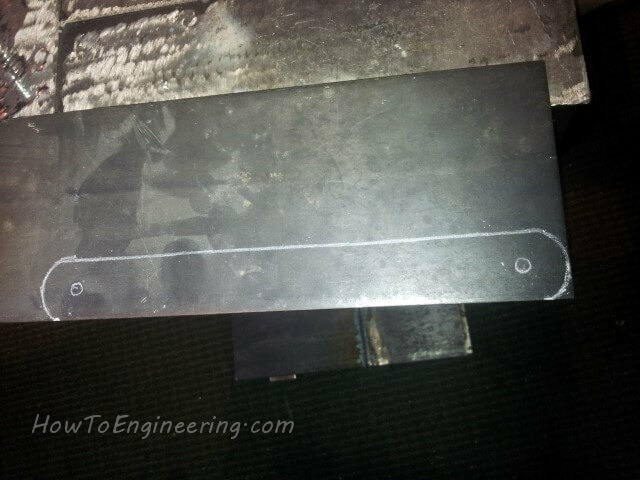 I also have a bit of 10 gauge sheet metal, I will use this on the bottom to support the battery. 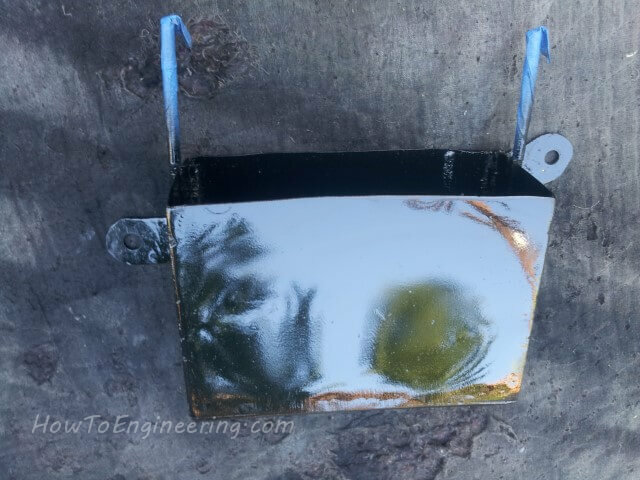 Since most of my metal is scrap metal, This piece is covered in paint, and who knows what. 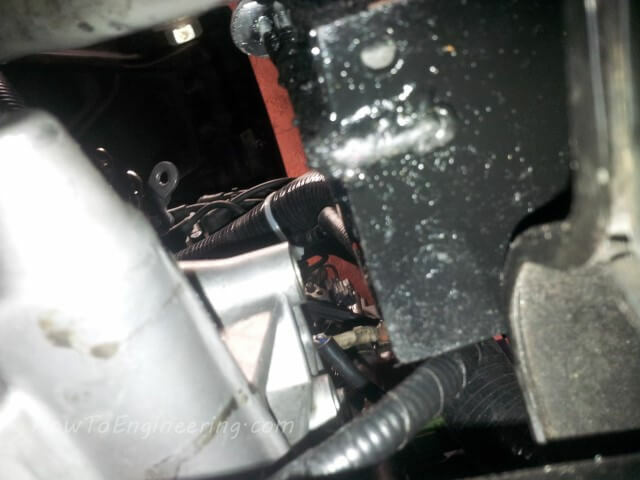 This side is not as bad… but still a lot of grinding to clean it up. 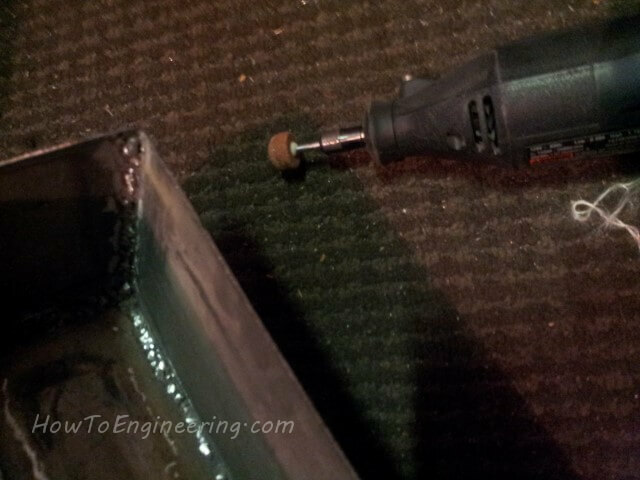 I used my angle grinder and a respirator. 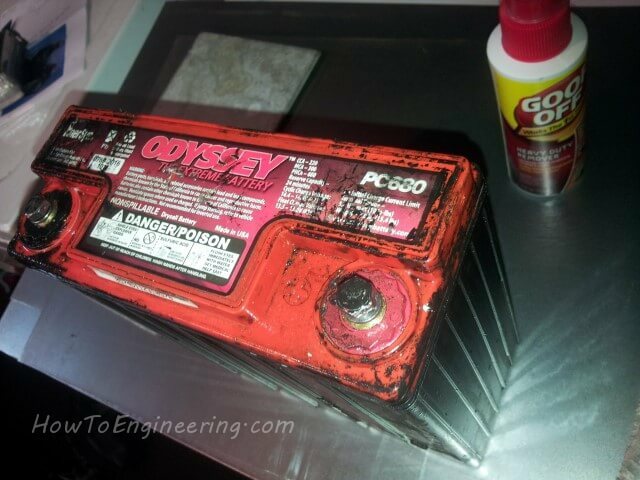 My battery was covered in glue from electrical tape, I used a bit of goo off and cleaned it up. 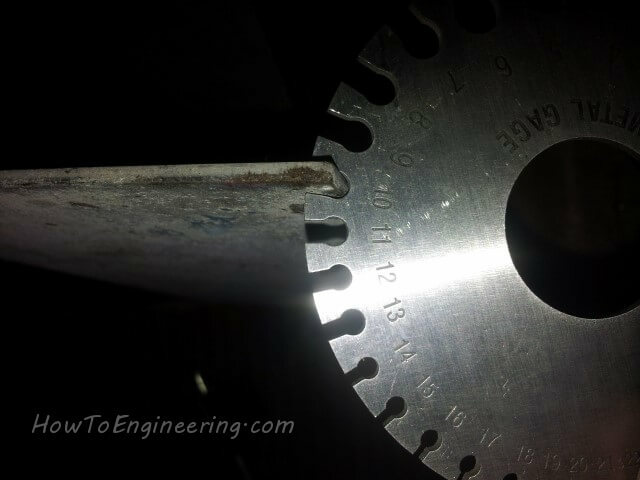 This is the 10 gauge, after a few passes with my angle grinder. 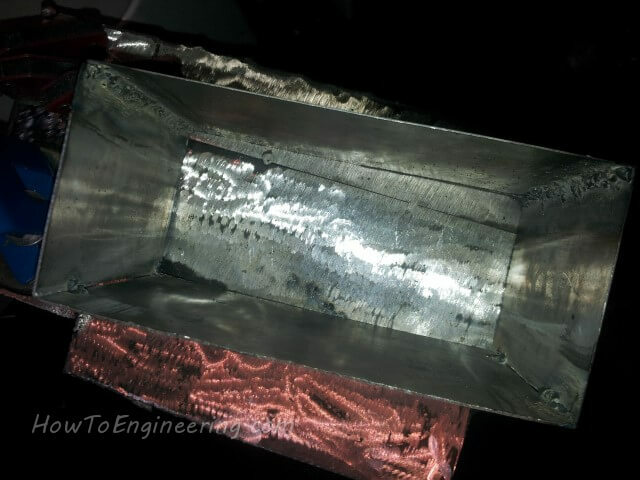 Fresh clean steel, ready to weld. 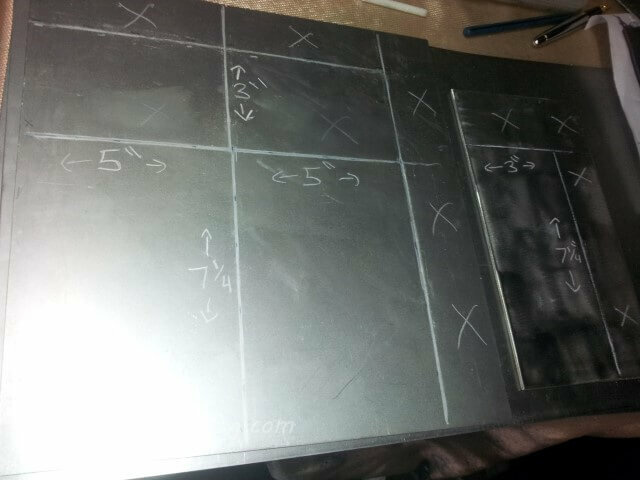 I used my soapstone to write out my cuts on the 22 gauge sheet metal. 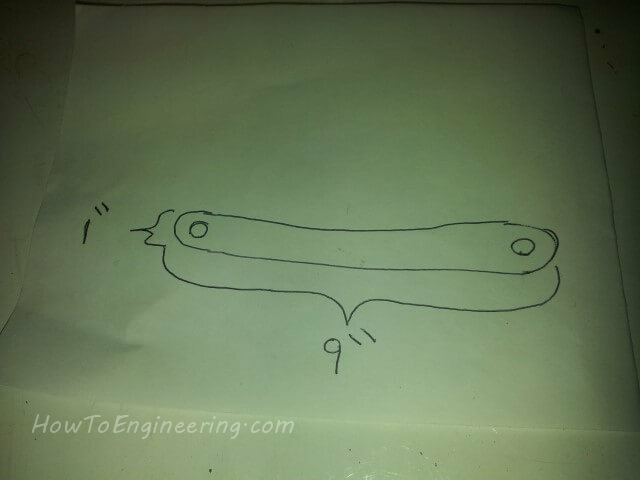 I put an X on the parts I do not need. 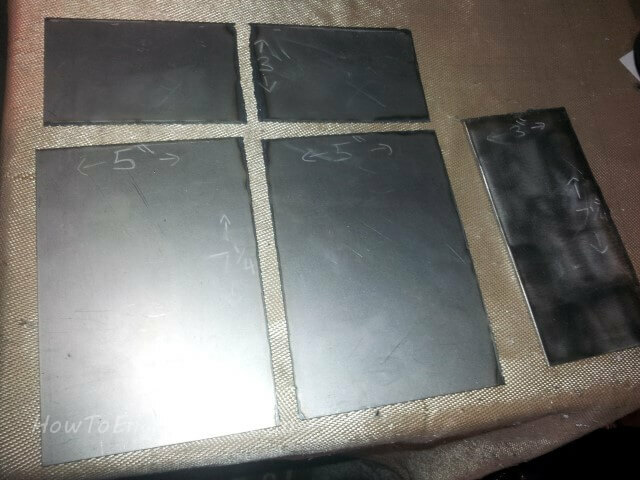 These are the cuts I made on the 10 gauge base plate. And those are the cuts I need to make. 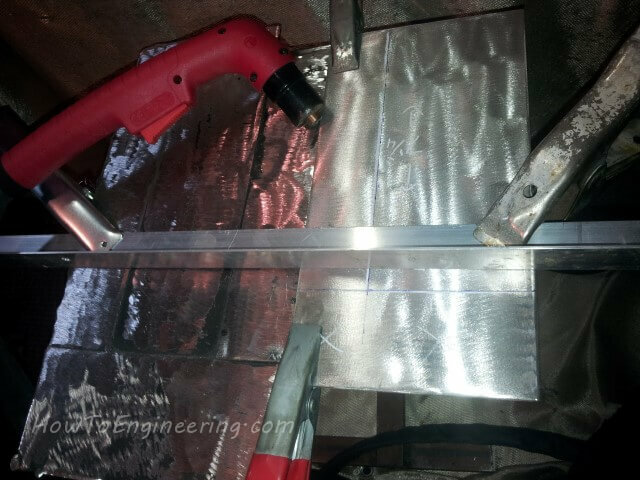 My method for cutting straight lines with my plasma cutter: I lay down an L shape metal strip with clamps to guide me. 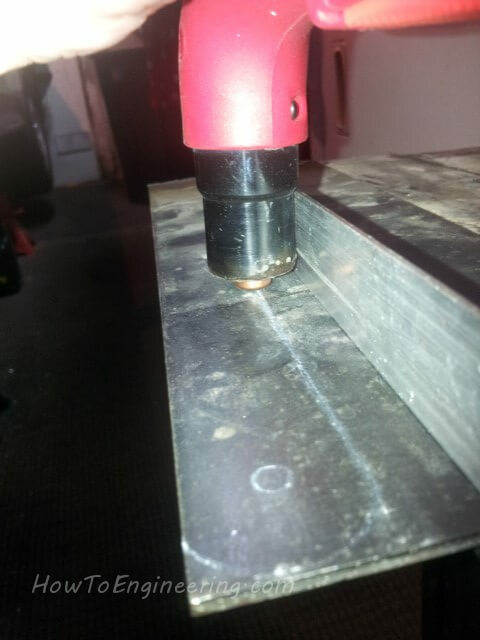 Here is a GIF picture showing you how the L shape metal guides the plasma cutter right on the line. This is how the cut looks. 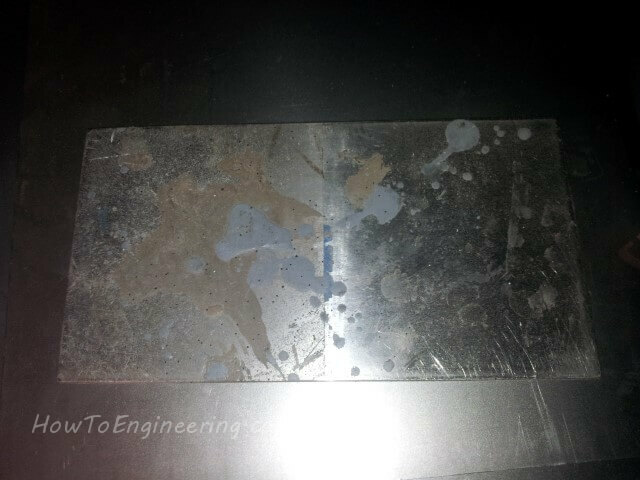 Later I will use my grinder to clean up the edges. 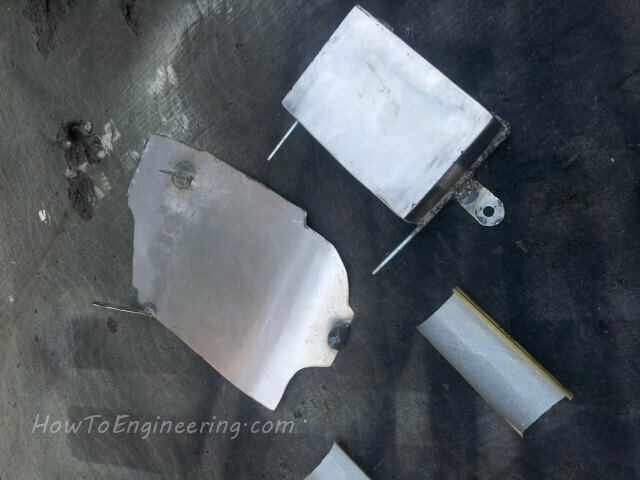 These are the pieces for the battery box. Just leaning the pieces on, it looks like a good fit. 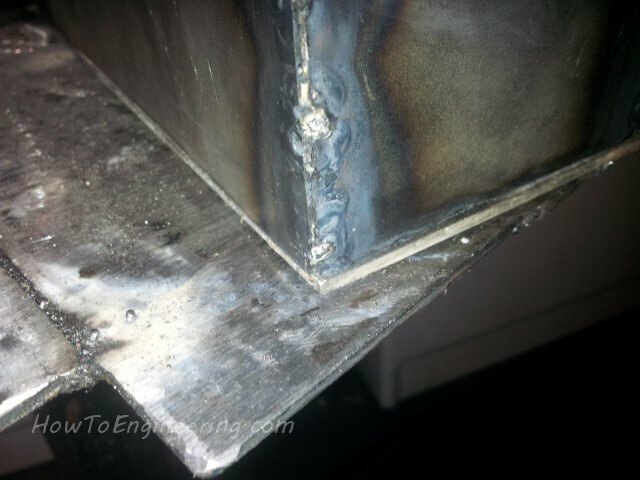 I used my MIG welder and welded from the inside. 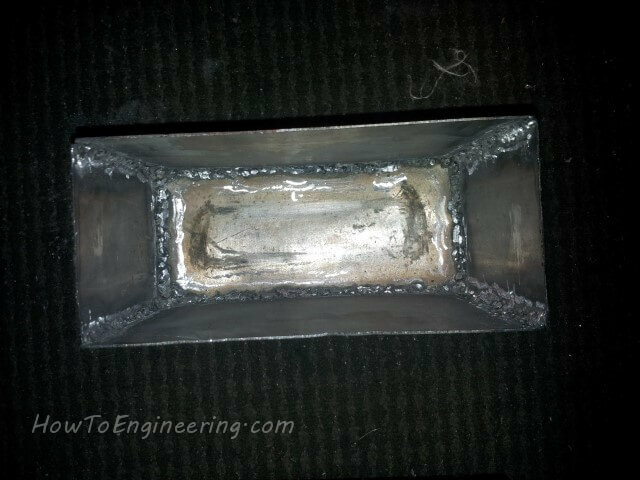 (After the project, I regretted not using the TIG welder). 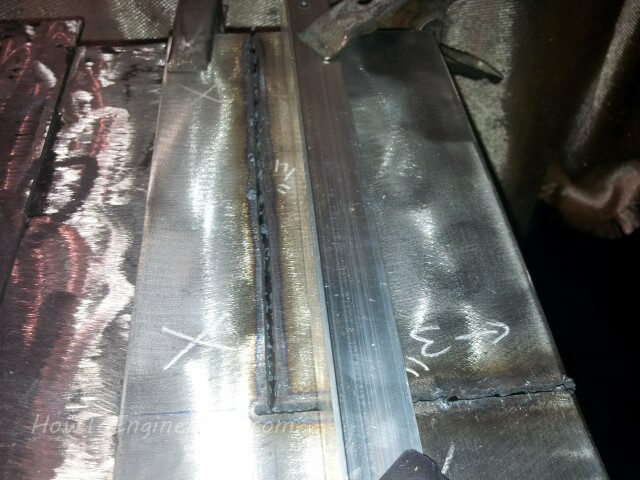 I started with a tac weld on each side. 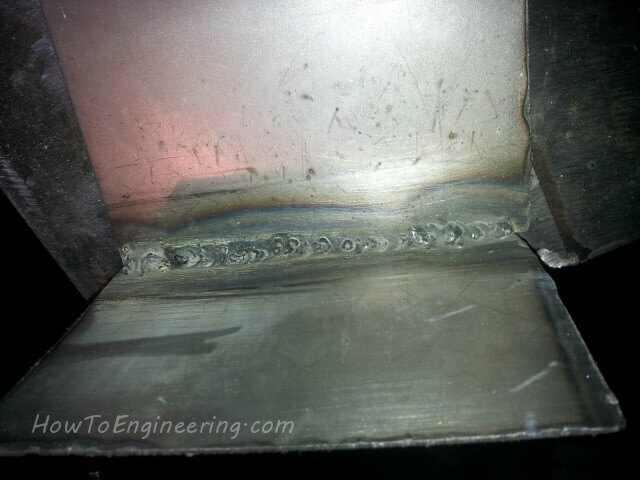 Then took my time to fill in the welds. 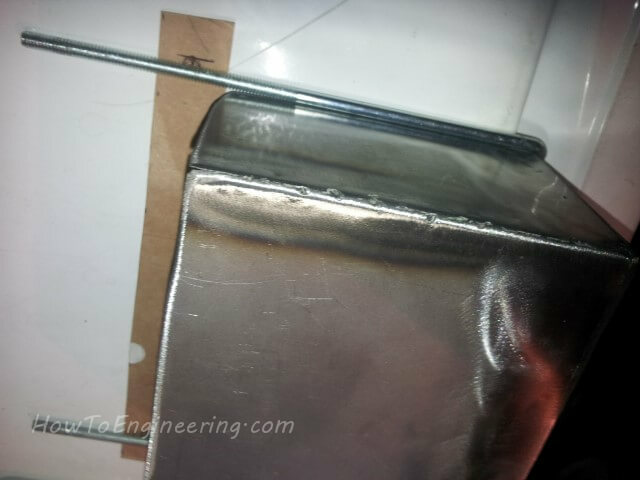 Being very careful to prevent blowing through (My MIG was not made for this thin of metal). 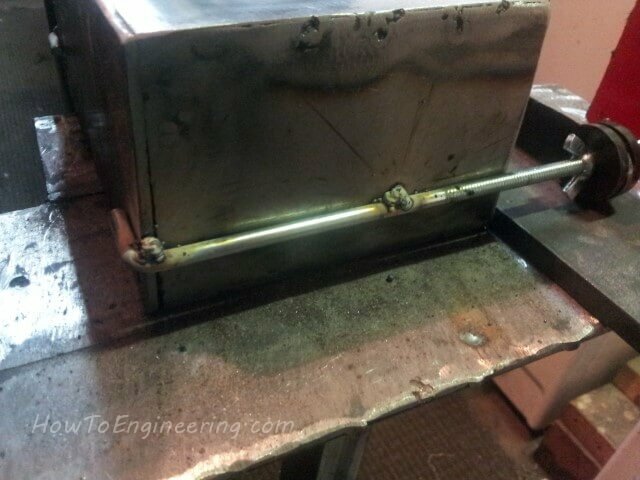 Now there are 3 sides welded together. 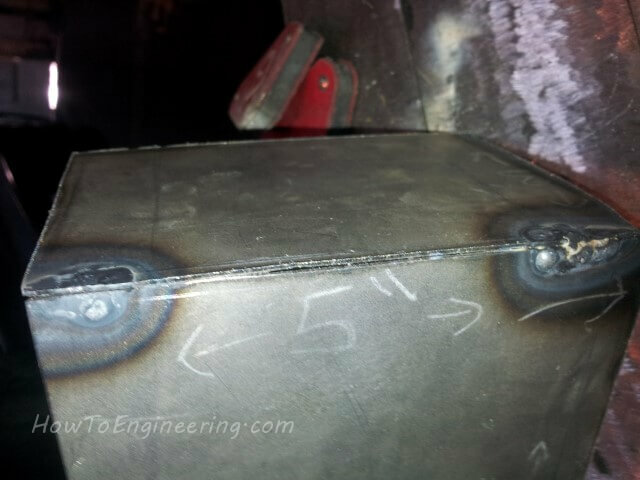 The 4th side is tac welded on. 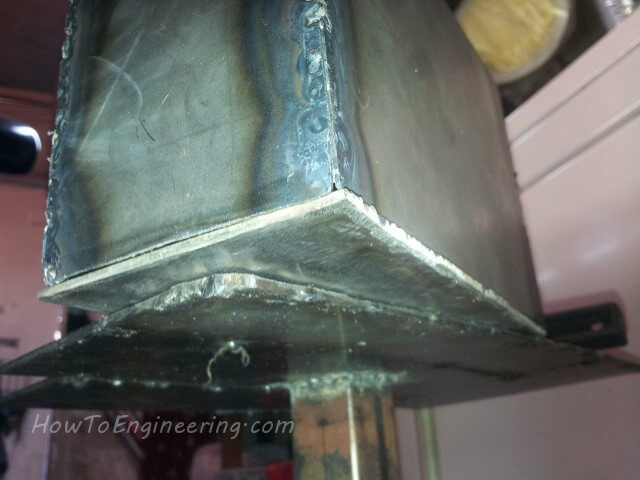 There is not much room to weld in there. 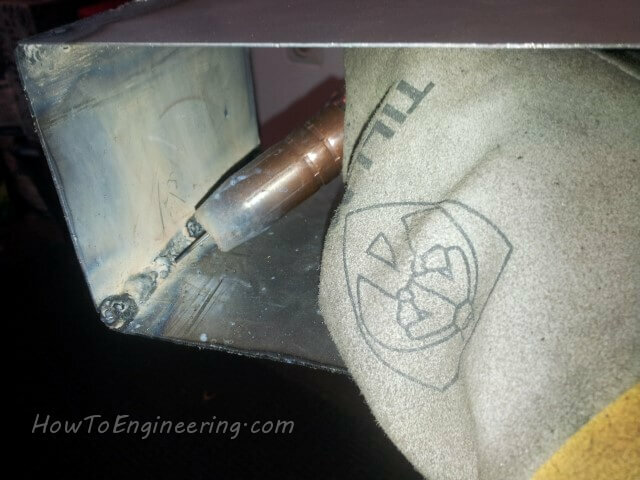 Here is a view how I was holding the welder. 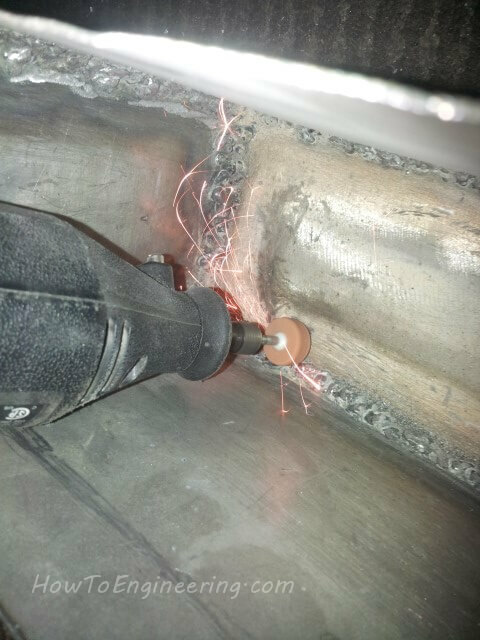 I used my left hand to help hold the welder steady, and I had a place to view from here. 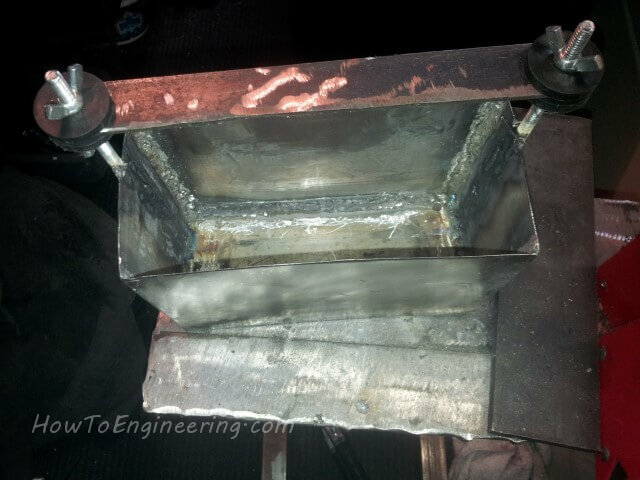 Now its time to weld the bottom on. 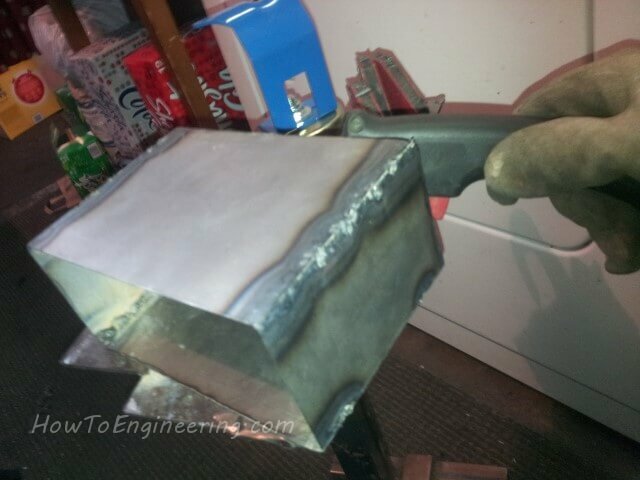 I held it in place with my mini welding magnets. I make sure everything is lined up. 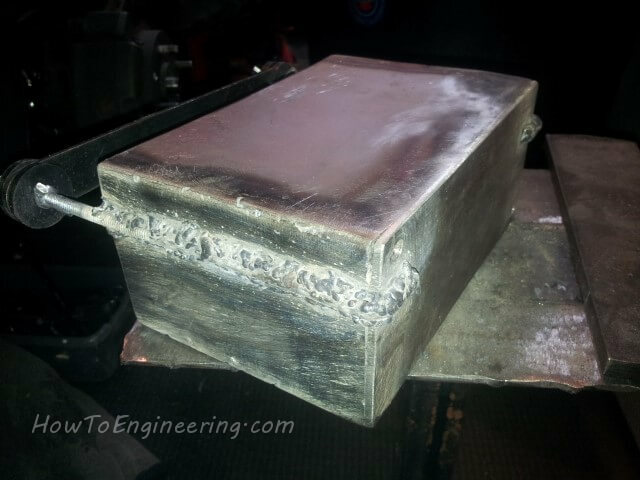 Now all the welds are done on the battery box. 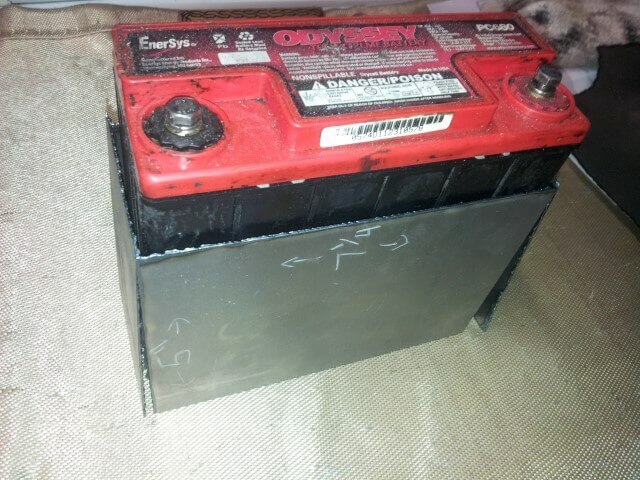 The battery fits, but I should grind the welds a bit to prevent damage to the battery. 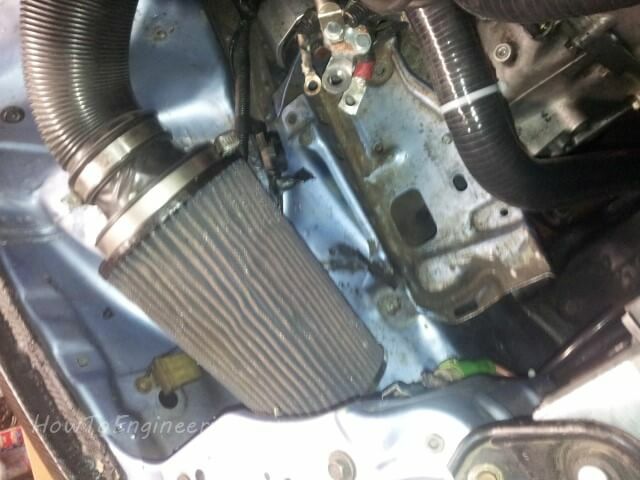 A view from above, Its a very tight fit. 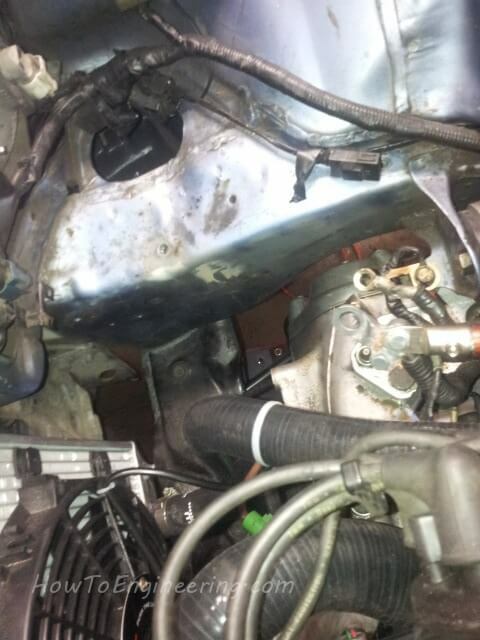 You almost can not see the battery box. 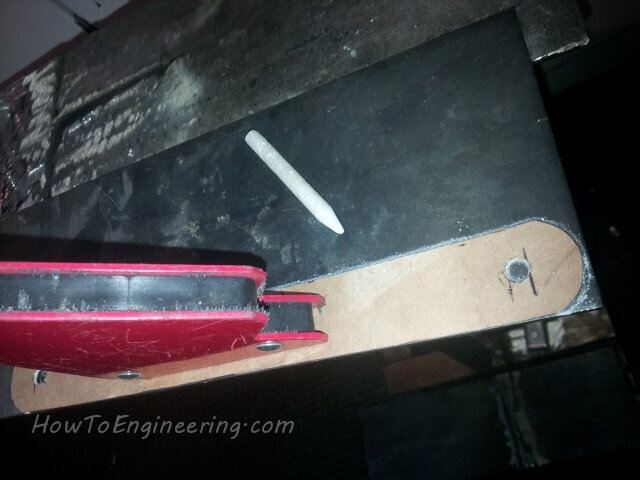 My air, bench and angle grinders will not fit inside, so I had to use the dremel. It worked…. very slowly. And I used about 5-7 grinding stones to grind everything to where I wanted it. Now everything is nice and rounded over. 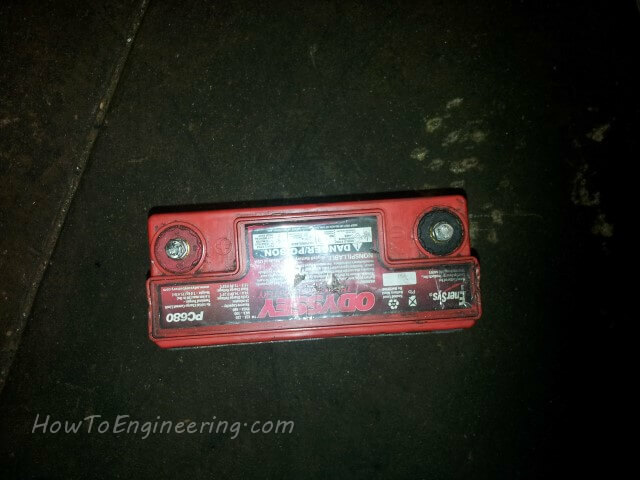 I had my battery on the charger/maintainer, and test fit it into the battery box again. Perfect fit. 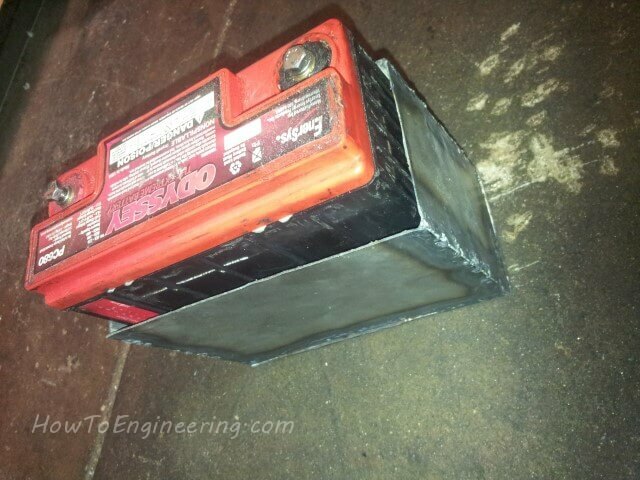 I used my angle grinder and cleaned up the surface and edges of the battery box. 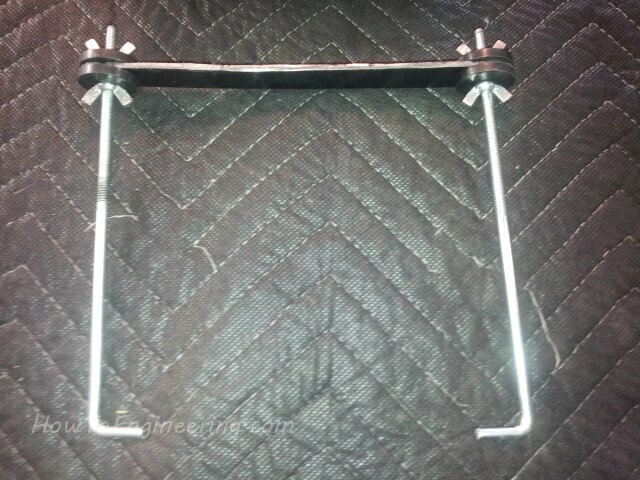 I now started on the top tie down bracket. 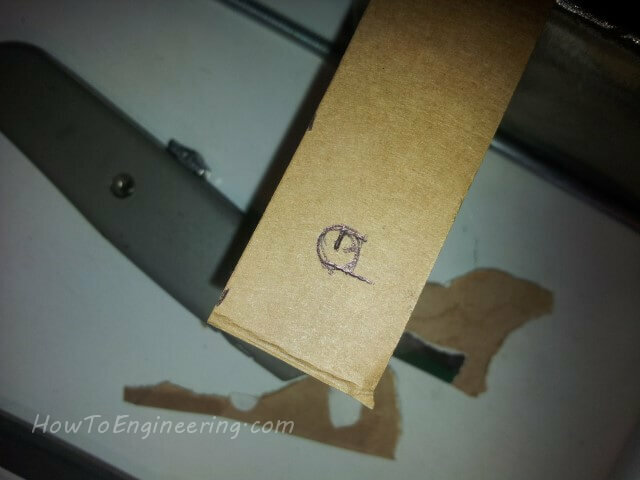 With the battery box laying on its side, I placed the 2 side posts down and laid a piece of cardboard down. I made a line on each side of the posts. 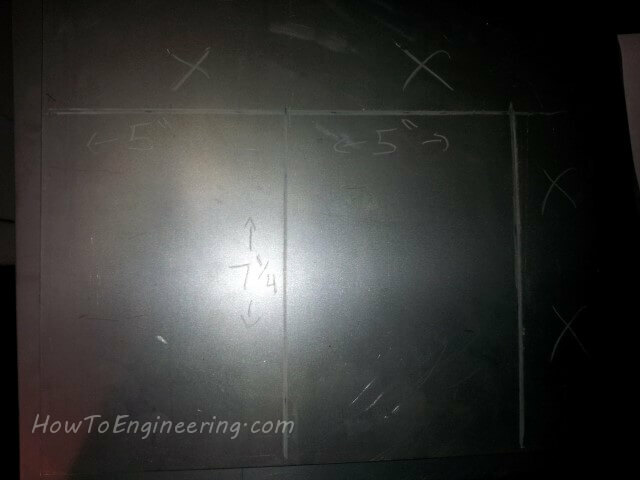 Then used a ruler to make a center line for the hole. 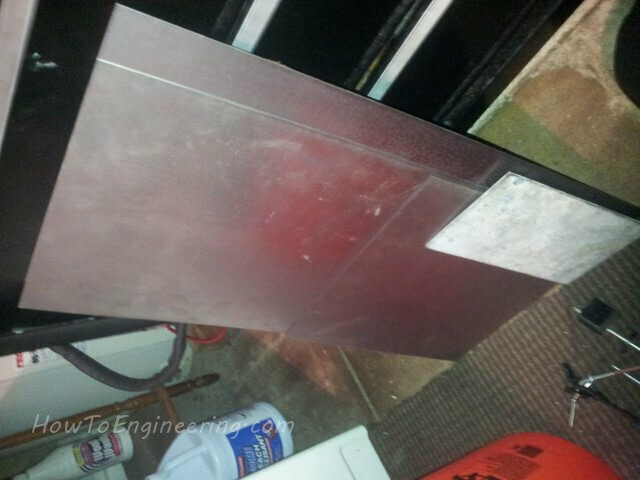 The hole was cut out with a utility knife. 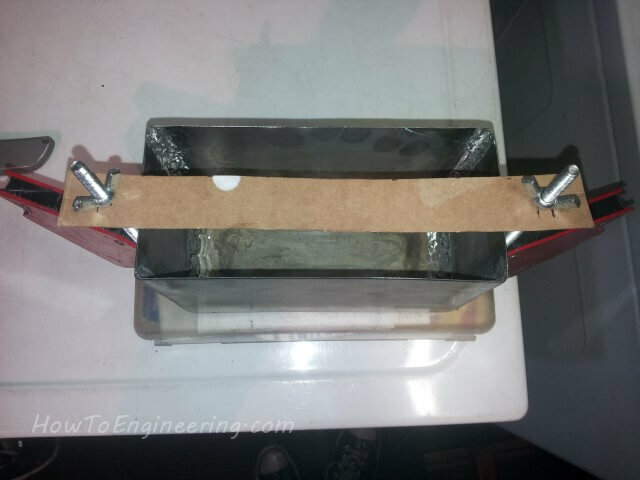 With the side posts held in with welding magnets, I test fit the cardboard template. 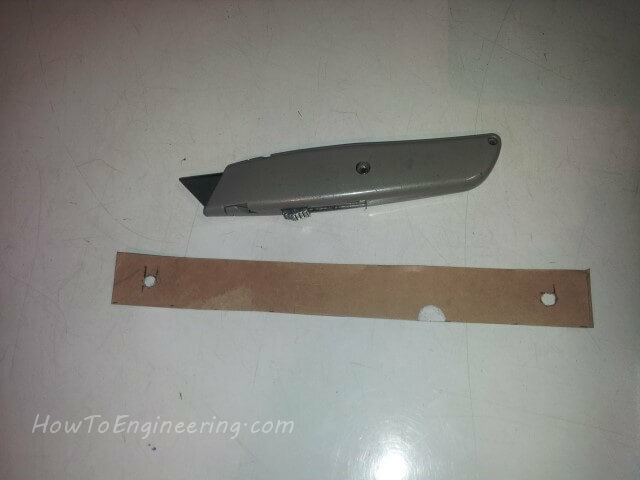 I trimmed the cardboard ends rounded, to about the size of the wing nuts. 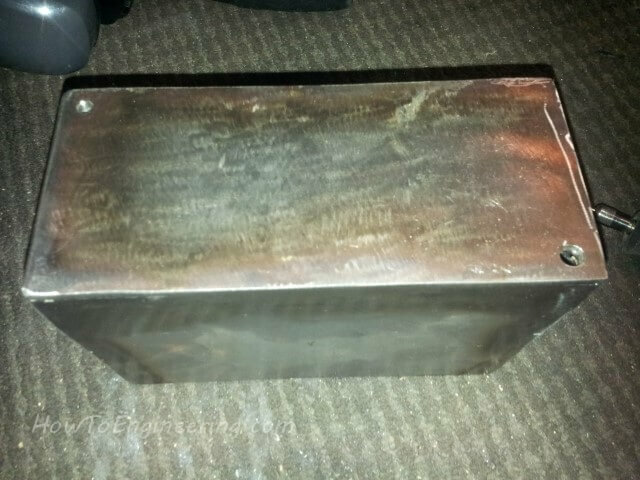 Here is some more scrap metal, This is 12 gauge, I will be using for my mounts. 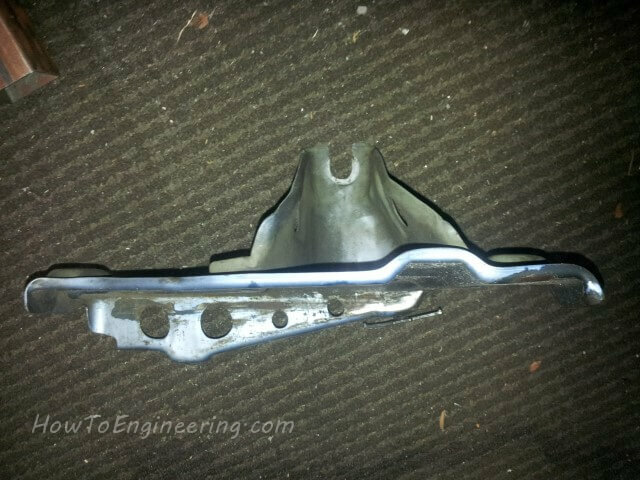 Since this is scrap metal, It had been welded together. I just cut it with my plasma. 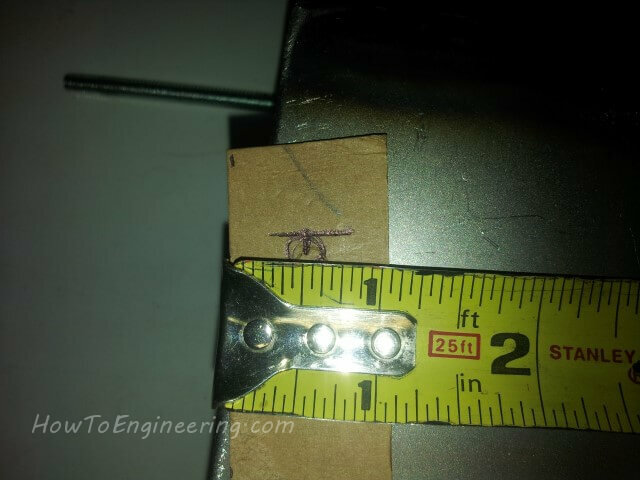 I placed the cardboard template onto the metal, and held down with a welding magnet. 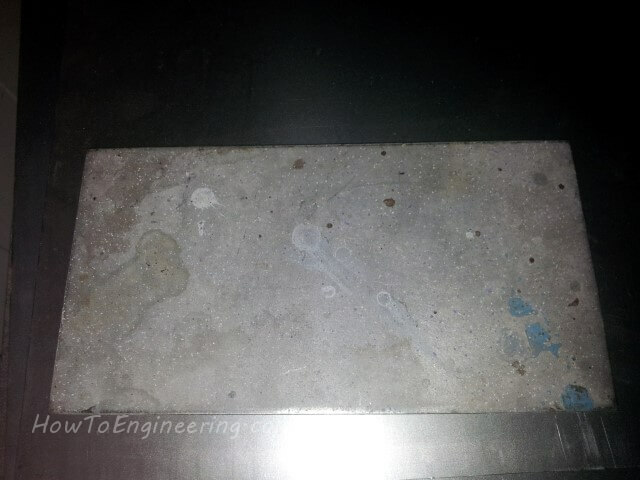 I traced the design to the metal using soapstone again. 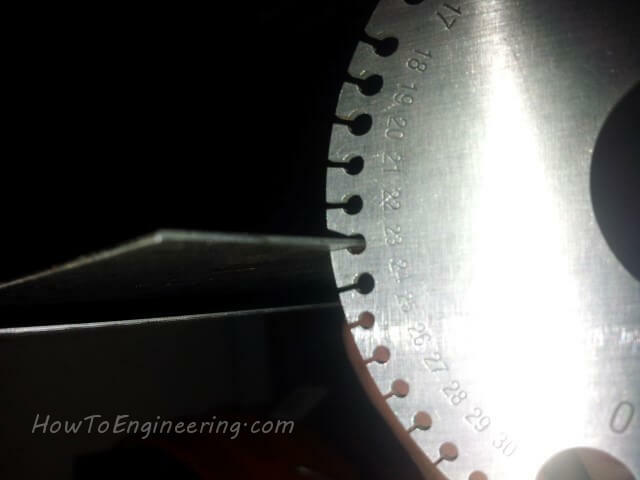 Looks good, ready to cut out. 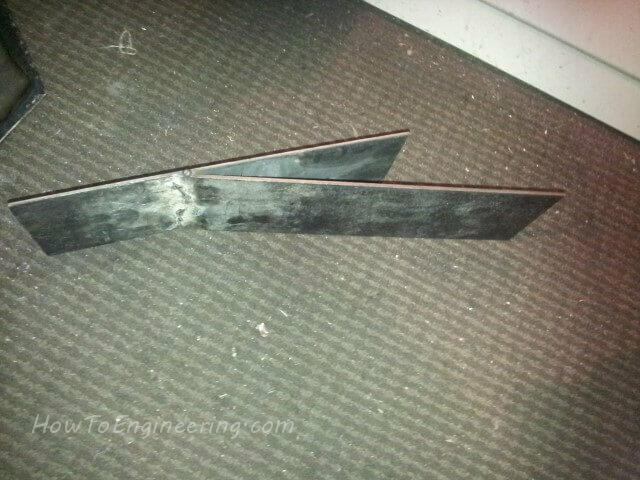 I used the L shaped metal again as a guide to cut the straight line. 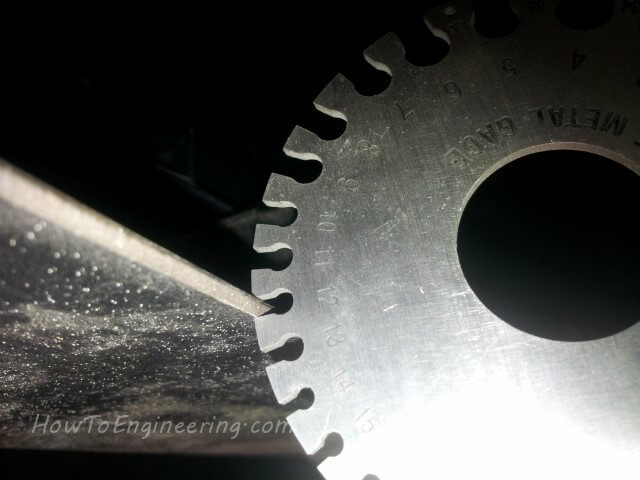 I then used the Drill press to make the 2 holes for the tie down. 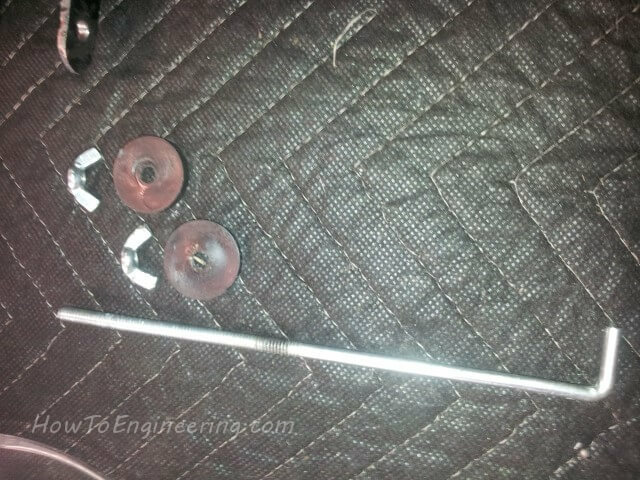 These are the parts for the tie down. 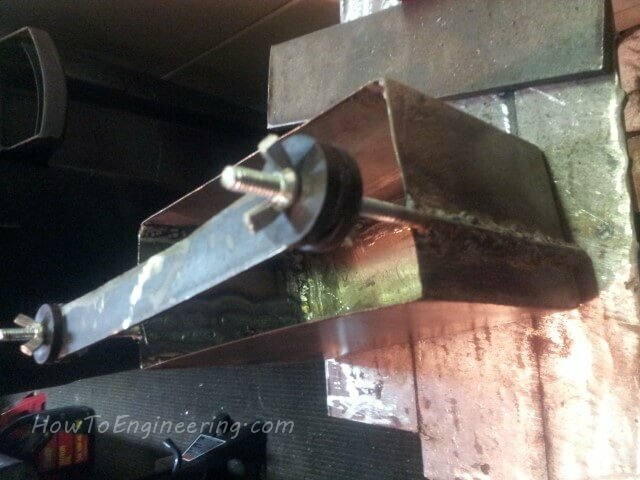 I clamped it in using 2 wing nuts, so everything will hold together solid. 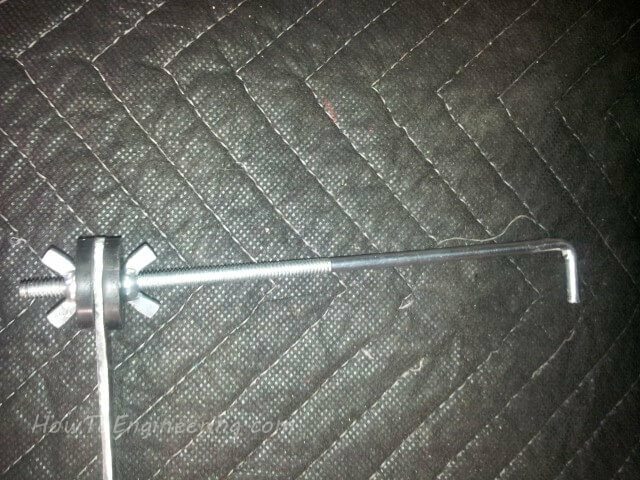 This is the entire clamp down, held together solid. 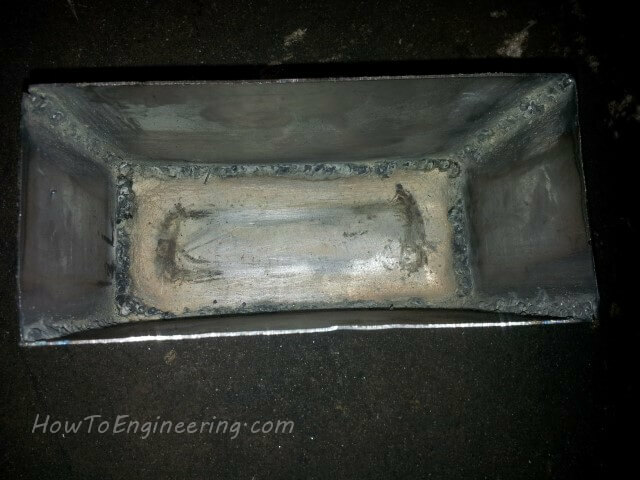 Before I weld the tie down to the battery box, I need to make drain holes for any rain water that gets in. 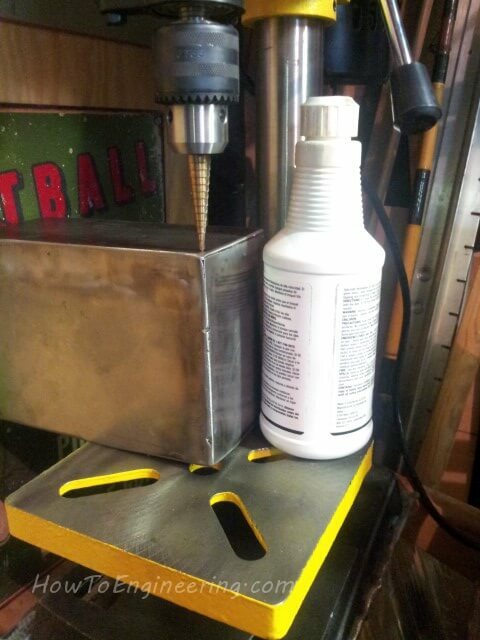 Again, I use my drill press and some cutting/drilling oil. 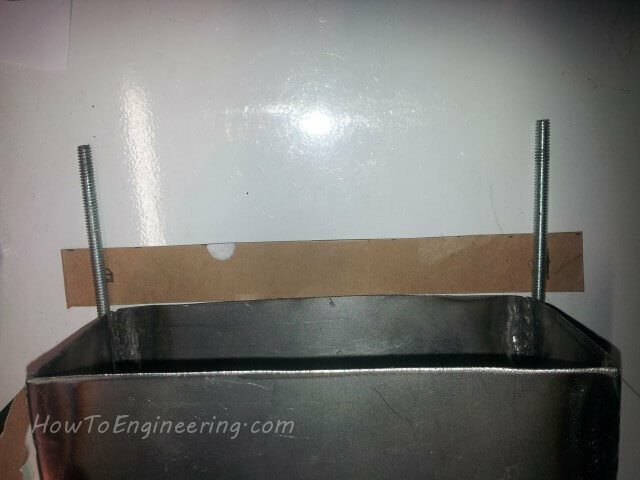 2 drain holes, on opposite corners. 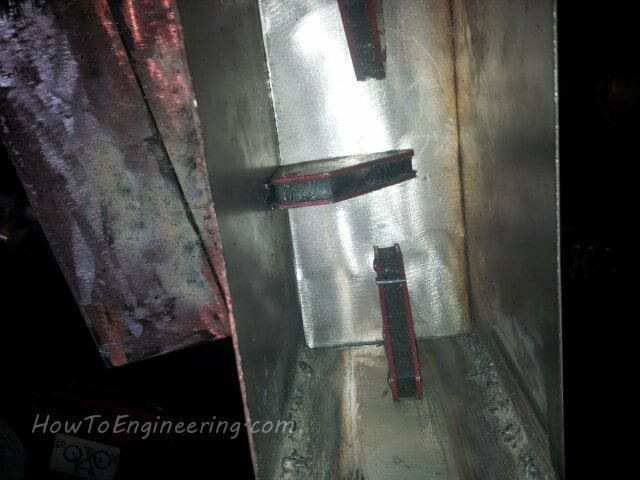 I used welding magnets and a piece of plate steel to hold up the tie down into position. 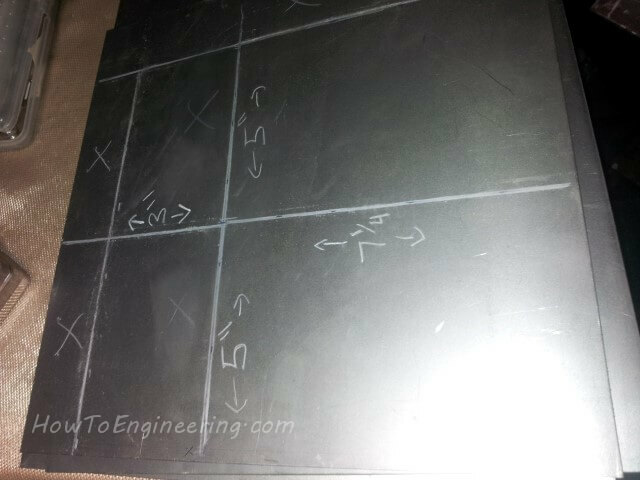 This is how I positioned the steel plate under the tie down. 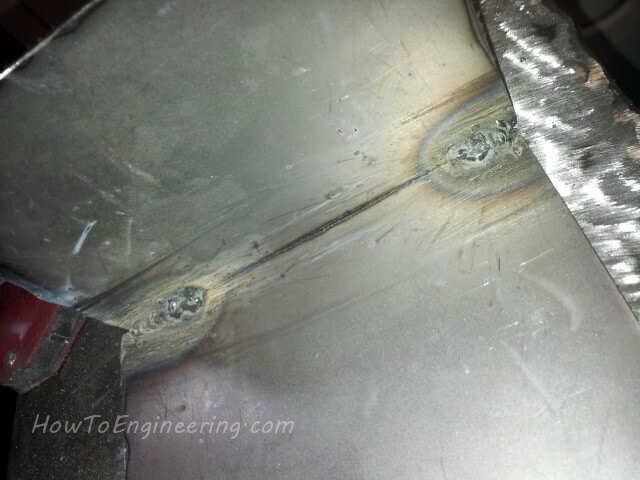 I started off with 2 tac welds on each side. 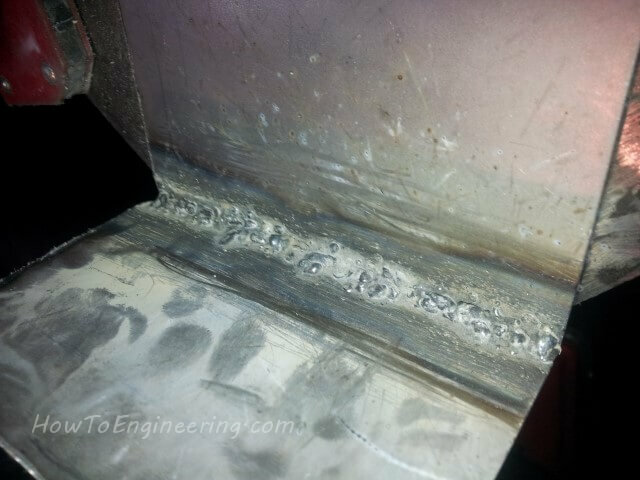 Then filled in the rest of the welds. 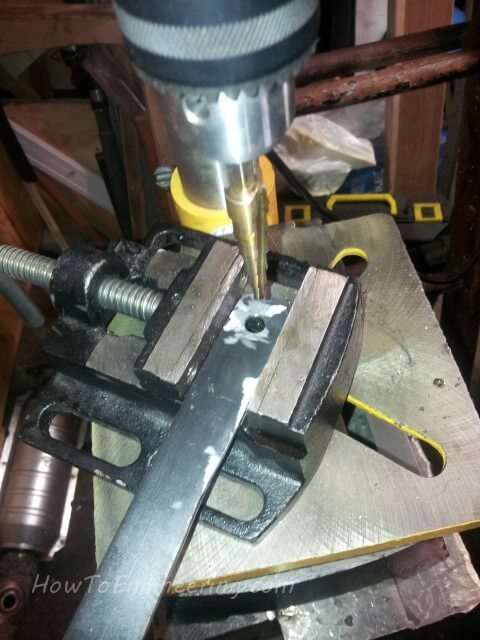 I even welded the bottom parts of the mount (They had to be bent into a 90 using my bench vice). So far so good. 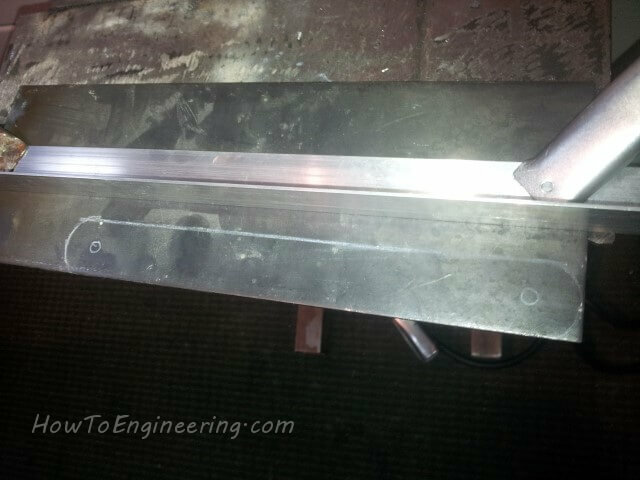 Now that everything is welded together, It can be placed into the car to measure for the mounts. 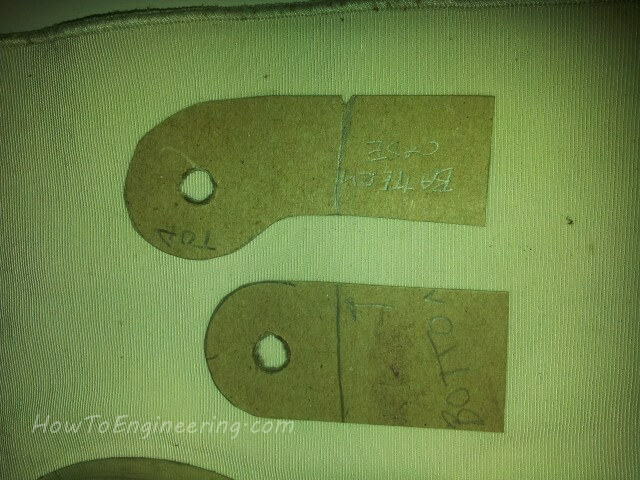 These are the cardboard templates for the 2 mounts. 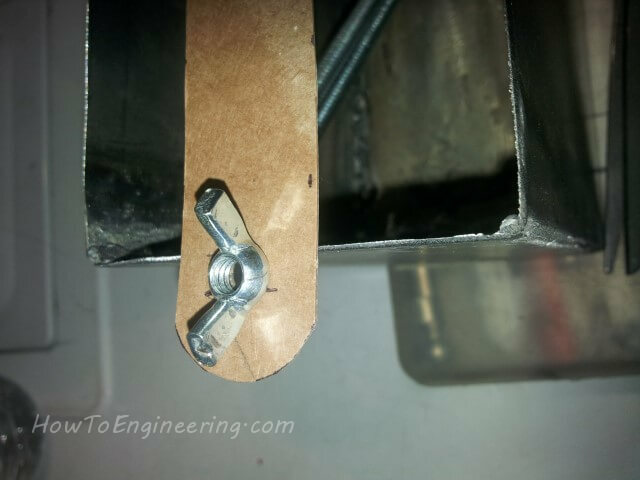 They use factory mounting points for the bolts. 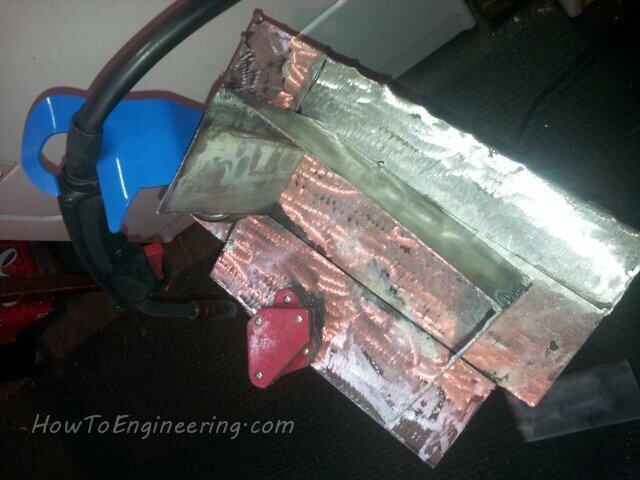 I traced the cardboard to the sheet metal, then cut them out with my plasma cutter. 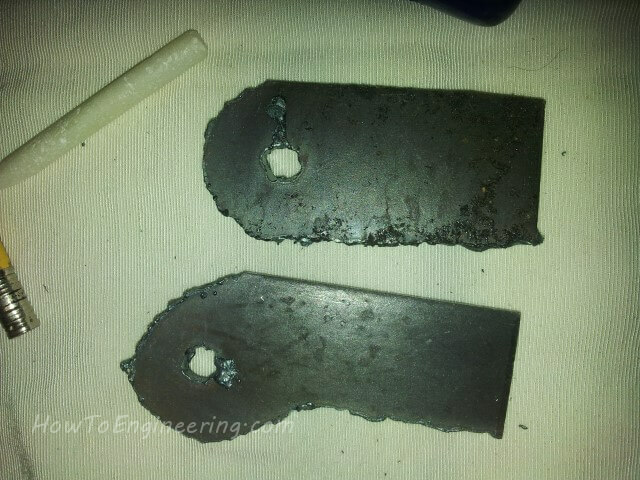 I then used my bench grinder to smoothen them out. 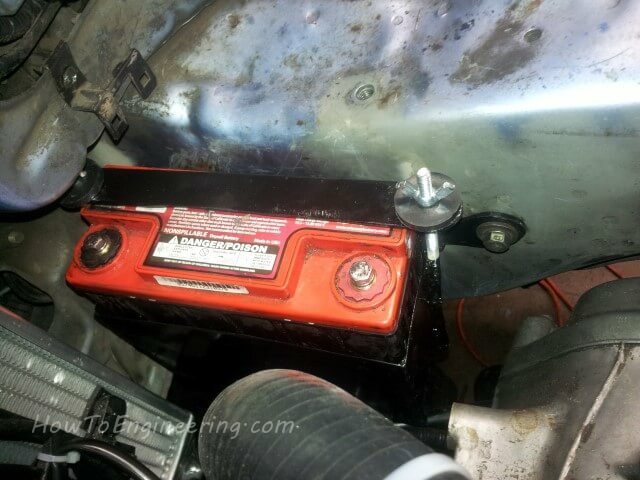 I bolted the mounts into the car, put in the battery box, and added a few tac welds. 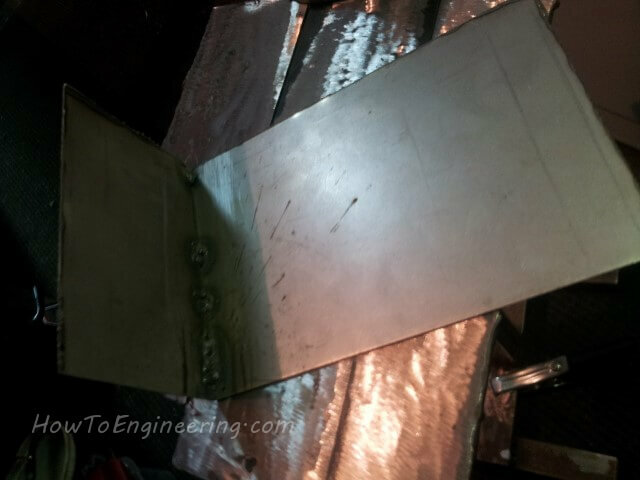 Then removed everything and welded it outside the car. 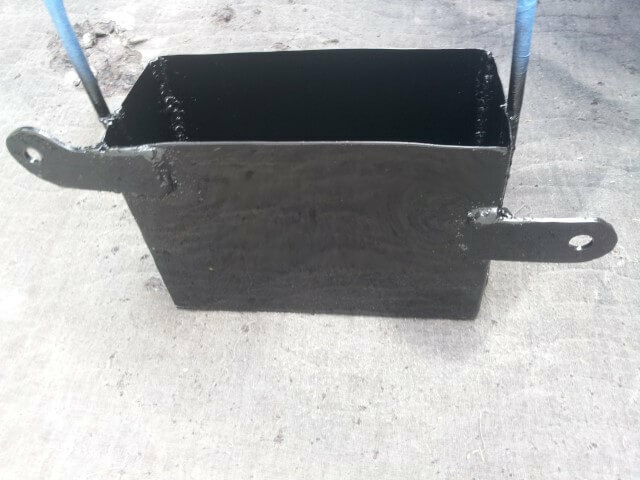 Now to sand everything and add some paint. 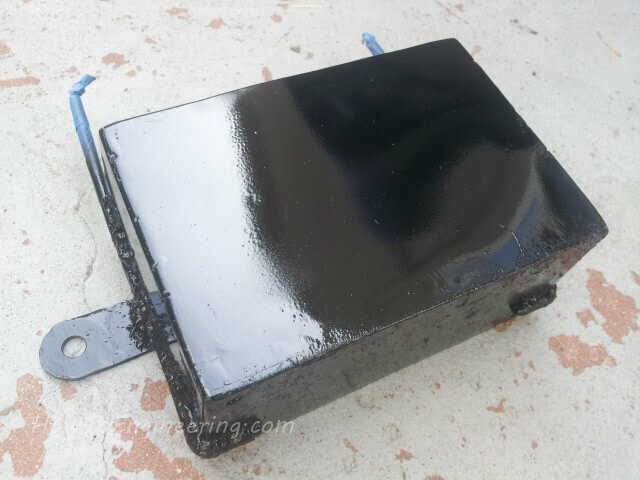 I used semi-gloss spray paint. 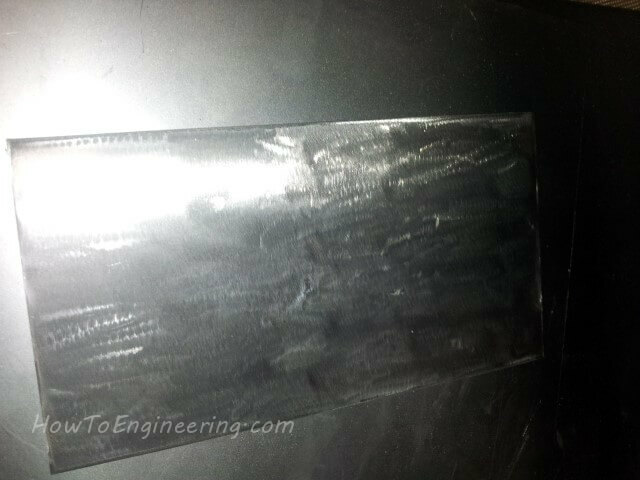 I added about 6 coats to protect the metal and prevent scratches. With the blue tape removed, you can see the nice threads for the tie down. Looks great. Ready to install in the car now. 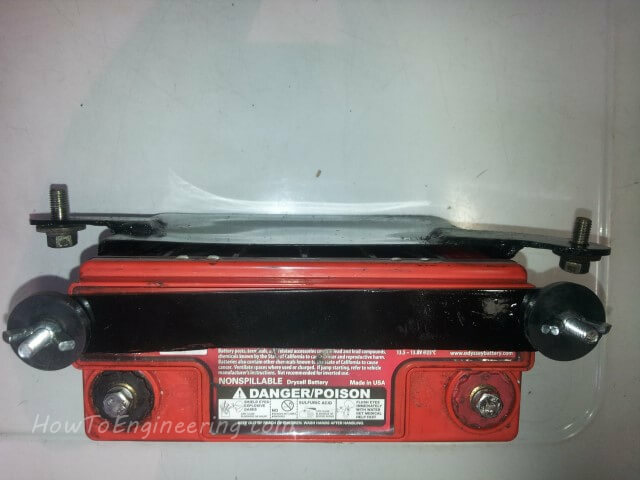 I will install this just above the black cross bar, one mount to the top tow hook and the other to the lower battery tray bolt. 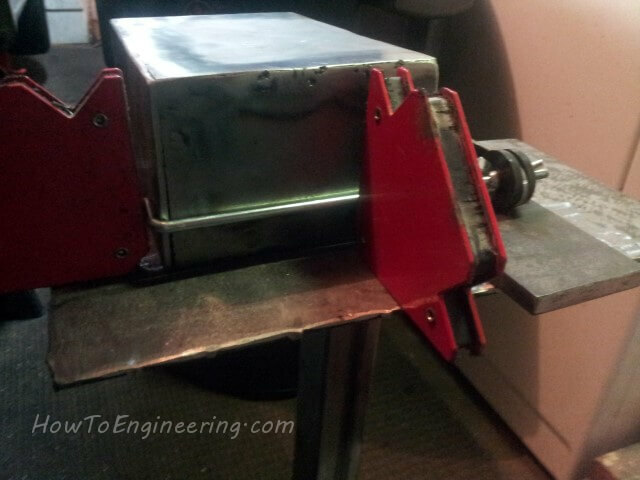 Here is a picture of the top, showing the mounts and bolts. 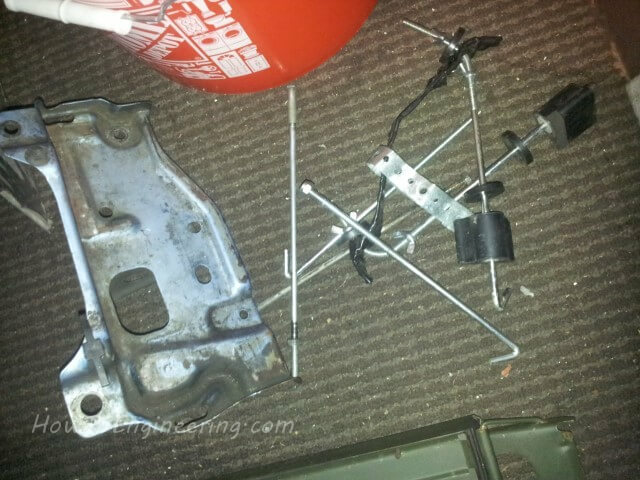 I had to bolt the tow hook upper bolt from under the car. 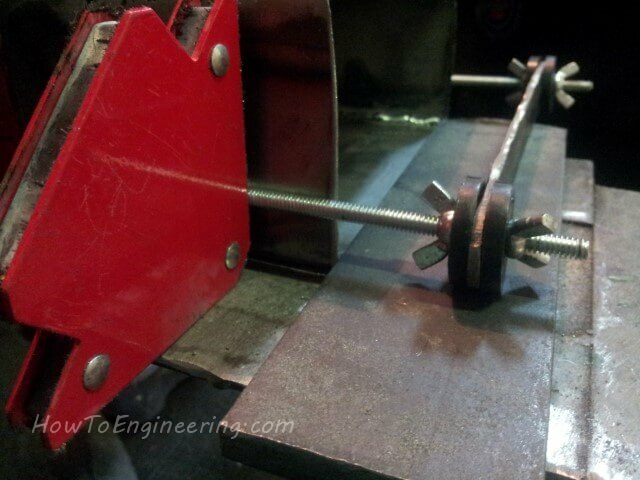 I started with this bolt because the other bolt is easy to access. 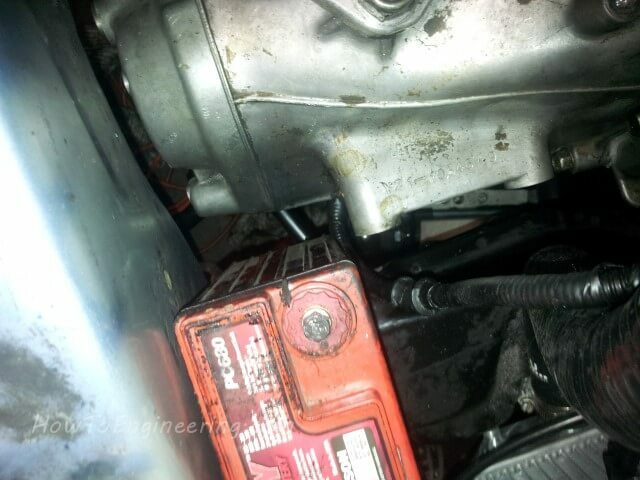 You can see here, there is plenty of space between the battery and the transmission housing. 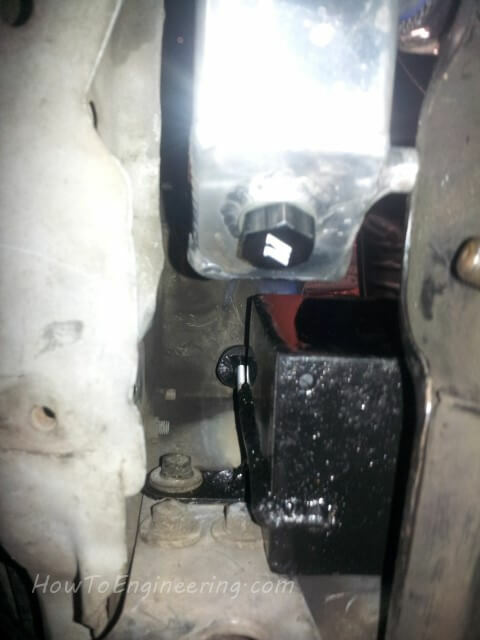 Now the other bolt is installed. 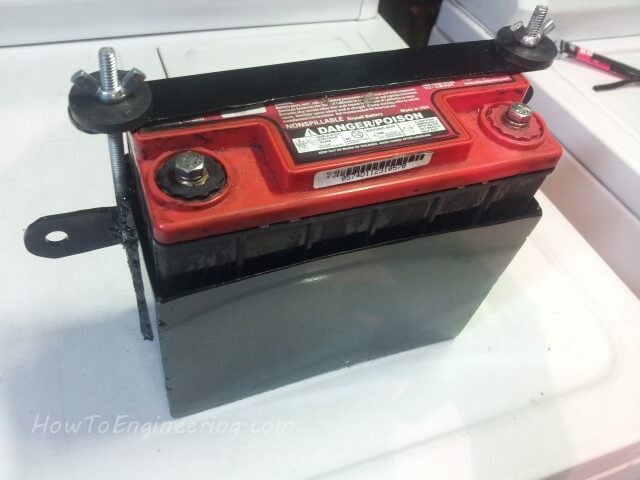 To remove the battery, I will have to remove the 2 bolts and take the entire battery box out. Not hard. 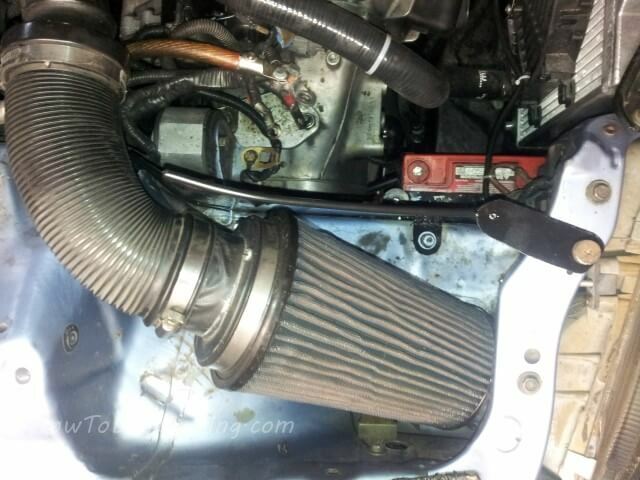 I just added my new intake air filter heat block. 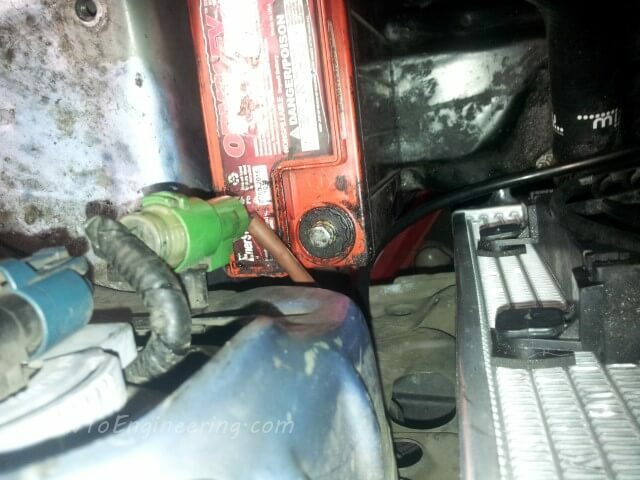 I have not connected the battery yet, but I used a single 0 gauge wire going to the battery and through the firewall (using a fuse/circuit breaker near the battery), then used a power distribution block to split it up behind the dash. 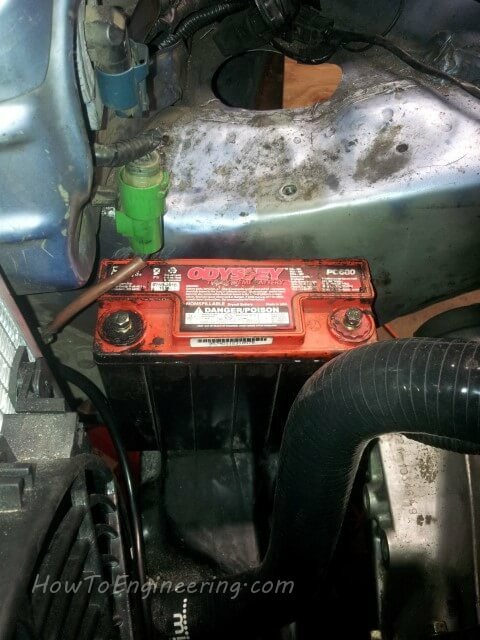 Nice and tucked away battery. 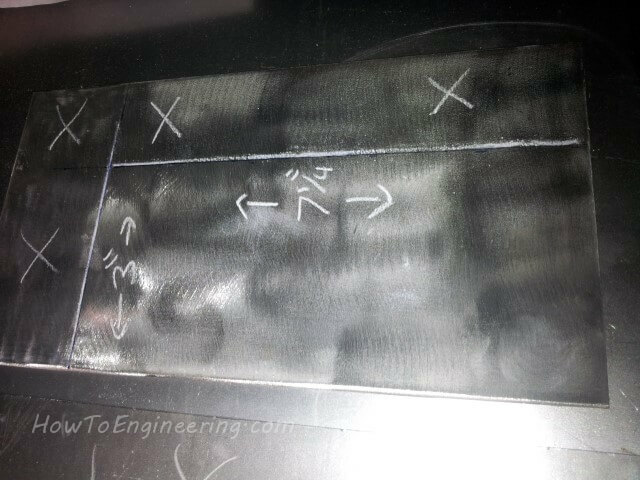 Next Next post: How I make my own hot air blocking panel for intake air filter.